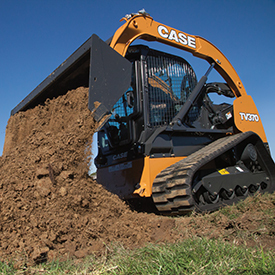 The CASE TV370 is a 74-hp compact track loader that combines a maintenance-free Tier 4 Final solution with the strength and reach of a large-frame CTL. The TV370 provides a 3,700-lbs. rated operating capacity (50 percent tipping weight) and a vertical-lift design that makes it ideal for loading trucks, and lifting and placing heavier palletized materials. The machine provides excellent auxiliary hydraulics for traditional attachment use in standard (24.2 gallons per minute (gpm) at 100 percent efficiency) and optional high-flow (37.6 gpm at 100 percent efficiency) hydraulic setups.